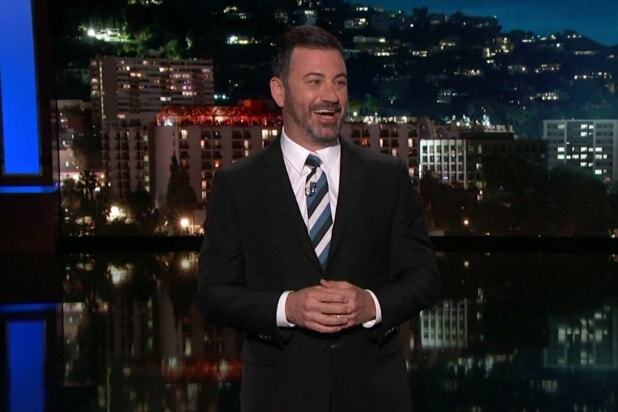 Jimmy Kimmel began his show Monday night with some jokes about the beginning of the NFL season, but it didn’t take long for the topic of conversation to steer back toward politics — and specifically these insiders who keep spilling the beans about all the weird, dumb things that keep going on inside the Trump administration, like those who were Bob Woodward’s sources for his new book “Fear.” A book that Donald Trump can’t stop promoting accidentally. Then “Jimmy Kimmel Leve” displayed all the tweets on an overlay behind Kimmel. “This morning I look at these tweets, I’m like, oh yeah, I gotta buy that! It comes out tomorrow,” he joked. This book is clearly getting under the president’s skin. This morning he tweeted that Bob Woodward is a liar and ‘Democratic Operative.’ Which is interesting because back in 2013, when Woodward wrote a book about Obama, he tweeted, ‘Only the Obama White House can get away with attacking Bob Woodward,’ ” Kimmel said. Then he moved on to Trump’s next, unrelated sequence of tweets. Kimmel then brought the topic full circle, discussing the story of a Trump tweet-that-almost-was as told in Woodward’s book. “According to Bob Woodward, at one point, Trump wrote and almost sent a tweet that could have started war with North Korea,” Kimmel said. “The tweet he wrote said he was planning to evacuate American families from South Korea — which would undoubtedly indicate to North Korea that we might about to launch an attack, and may have motivated them to launch a preemptive attack. You can watch Monday’s episode of “Jimmy Kimmel Live” on the ABC app or on ABC.com right here.